Sometimes a good sandwich is just the thing for a weeknight dinner or casual Sunday afternoon. 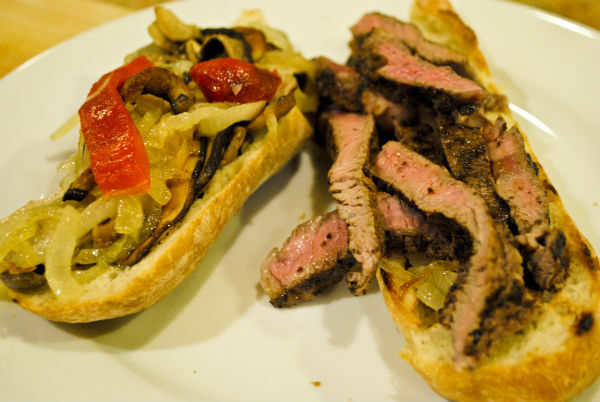 A steak sandwich is easy to put together and sooo satisfying. I purchase a rib-eye roast and slice off steaks about ½ inch to ¾ inch thick, seasoned them simply and grill them over an open flame until dark on the outside and juicy pink medium on the inside. 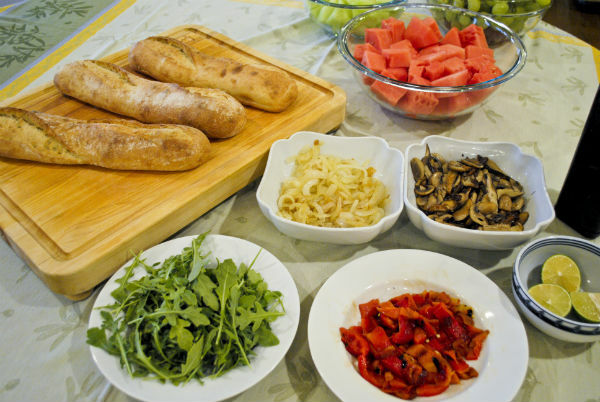 A couple of French baguettes and some accompaniments and dinner is all set. 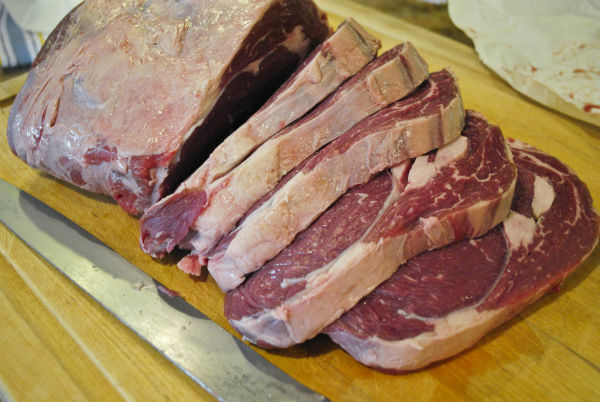 Place rib-eye steaks in a large baking dish. Season steak with salt, pepper, juice of limes, and sumac. 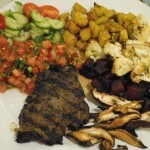 Set steak aside and prepare vegetables. Clean mushroom caps with a damp paper towel. 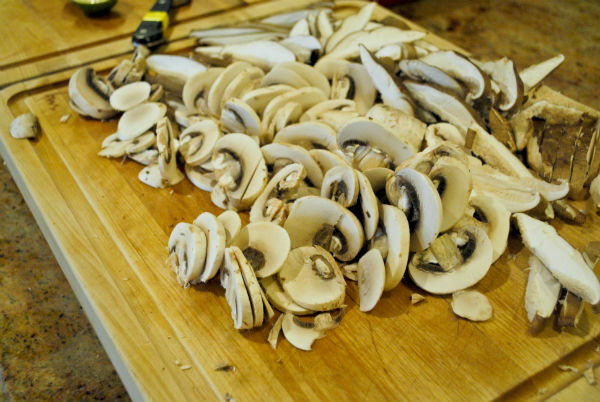 Trim mushroom stems and then, slice mushrooms thinly on a cutting board. Place mushrooms in a large bowl and preheat a 12 inch or larger skillet. 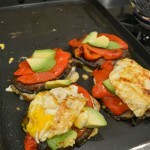 When skillet is very hot add 3 tablespoons of olive oil and immediately add mushrooms. Sauté mushrooms until cooked through and golden brown. Saute′ing mushrooms in a preheated very hot pan, prevents mushrooms from releasing water, instead they sear, brown, and have more flavor. Season mushrooms with salt and pepper. Place mushrooms in an appropriate sized serving bowl. Wash and dry bell peppers, char peppers on an open flame and then, place them in a paper bag to finish steaming. 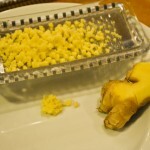 After 10 minutes remove peppers from paper bag, peel them, and seed them. Slice peppers into julienne strips and place them in a serving bowl. Peel onion and slice in thin half circles on a cutting board. Preheat another clean 12 inch skillet until warm on medium heat, add two tablespoons olive oil and then, add sliced onions. Sauté onions until caramelized over medium heat. Season with salt and pepper. Place cooked onions in an appropriate sized serving bowl. Preheat barbecue grill or grilling pan with ridges until very hot. Spray steaks with oil. 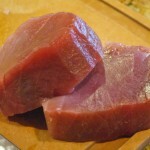 Sear steaks on both sides, turning only once with a tong, until desired degree. 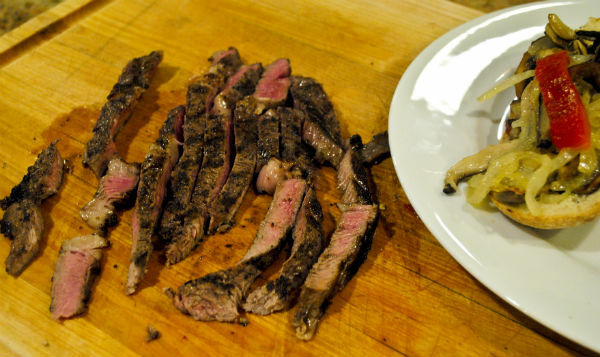 Remove steak from grill and place on a cutting board. Let steak rest for about 5-10 minutes. 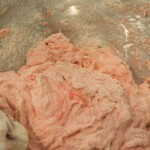 While steak is resting split baguette in half and brush with a bit of olive oil using a pastry brush or silicone brush. Grill baguette for a couple of moments to warm and toast. Many other condiments are also good on this sandwich such as, mustard, mayonnaise, barbecue sauce, or avocado slices.